:To craft informed sermons, pastors scour commentaries that often deal more with minutia than the main point. Or they turn to devotional commentaries, which may contain exegetical weaknesses. The Teach the Text Commentary Series bridges this gap by utilizing the best of biblical scholarship and providing the information a pastor needs to communicate the text effectively. By concentrating each carefully selected preaching unit into six pages of focused commentary, each volume in this series allows pastors to quickly grasp the big idea and key themes of each passage of Scripture. Each unit of the commentary includes the big idea and key themes of the passage; sections dedicated to understanding, teaching, and illustrating the text; and full-color illustrations, maps, and photo. About "Psalms #01: Chapters 1-72 (Teach The Text Commentary Series)"
C. Hassell Bullock (Ph.D., Hebrew Union College) is Franklin S. Dyrness Professor of Biblical Studies at Wheaton College. He is the author of An Introduction to the Old Testament Poetic Books and coeditor of The Literature and Meaning of Scripture. 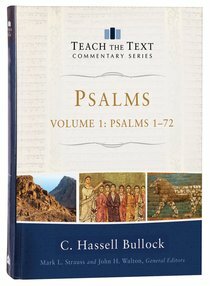 Customer Reviews For "Psalms #01: Chapters 1-72 (Teach The Text Commentary Series)"
I was pleasantly surprised at just how detailed and useful C. Hassell Bullock's 'Psalms 1-72' in the Teach the Text (TTT) series by Baker Books is. To begin with this is an extremely well-rounded commentary. The author is clearly comfortable and capable exegeting the Hebrew text, and he also consistently provides incisive, penetrating and to my mind convincing theological points and applications (although a few of the latter seem more forced than is probably warranted by the text). If the second volume is as good as the first, this will potentially be the 'best' general resource for preparing sermons on the Psalms currently available. I should add 'Psalms 1-72' compares favorably to Dr Gerald Wilson's volume in the NIVAC Old Testament series, albeit the former has little over half the page count of the latter. And where the NIVAC has sections related to (1) 'Original Meaning'; (2) 'Bridging Contexts'; and (3) 'Contemporary Significance'; the TTT has (1) 'Understanding the Text' (including the sub-categories of 'The Text in Context', 'Outline Structure', Historical and Cultural Background', Interpretative Insights' and 'Theological Insights'); (2) 'Teaching the Text'; and (3) 'Illustrating the Text'. In short, the aim of the series is to move from exegesis through exposition to application ending in worship, and Dr Bullock does this extraordinarily well.